Find artworks, auction results, sale prices and pictures of Girolamo Romanino at auctions worldwide. A. Nova, Girolamo Romanino, Turin 1994, p. 357, ill. 263. 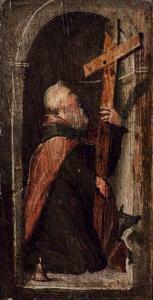 The panel shows Saint Paul supported by his sword in simple architectural surroundings. The painting displays a lively and radiant colouring, the clear composition, and the posture of the apostle, head sunk in thought, expressing his introspective and intellectual nature. The format and surroundings suggest that the panel may have been part of the upper series of paintings in a polyptych. The painting is comparable to the polyptych of the Birth of Christ with Saint Alexander, Hieronymus, Gaudenz and the Blessed Felice Servita which is dated 1525 (London, National Gallery) and was originally painted for the church of Sant\’\’\’\’ Alessandro in Brescia. 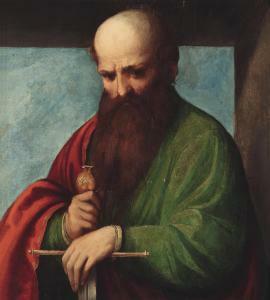 Stylistically, the figure of Saint Paul demonstrates great similarity to the Blessed Felice noted above, and it is probable that the painting dates to the period around 1525. The execution of the slender, delicate fingers and facial expression on the face are also reminiscent of Romanino\’\’\’\’s Ecce Homo (Hannover, Landesgalerie Lower Saxony) which dates to 1550. Romanino received his artistic training between Brescia and Venice and was initially influenced by the works of Giorgione. He painted numerous panels and frescoes in Lombardy and the Veneto for churches and as well as private commissions. His works are characterised by the use of Venetian colouring in the style of Titian, with models and figures more typical for Florence and Lombardy painting. (Possibly) Paolo Brognoli, Brescia, by 1820. Cesare and Antonio Averoldi, Brescia, by 1853. Benigno Crespi, Milan, by 1900; Galerie Georges Petit, Paris, 4 June 1914, lot 52 (5,000 FF to 'Trotti'). Federico Gentili di Giuseppe (1868-1940), Paris. Forced sale of his Estate, Hôtel Drouot, Paris, 24 April 1941, lot 67. Polli collection, Milan, by 1996. Pinacoteca di Brera, Milan, acquired from the above, 1998. Restituted by order of the United States District Court, Northern District of Florida, 6 February 2012, and returned to the heirs of Federico Gentili di Giuseppe, 18 April 2012. F. Odorici, Guida di Brescia: rapporto alle arti ed ai monumenti antichi e moderni, Brescia, 1853, p. 179. J.A. Crowe and G.B. Cavalcaselle, A History of Painting in North Italy: Venice, Padua, Vicenza, Verona, Ferrara, Milan, Friuli, Brescia, from the fourteenth to the sixteenth century, London, 1871, II, p. 396. F. Odorici, Guida di Brescia. Rapporto alle arti ed ai monumenti antichi e moderni, Brescia, 1882, p. 154. A. Venturi, La Galleria Crespi in Milano: note e raffronti, Milan, 1900, pp. VIII, 127, 129. B. Berenson, North Italian painters of the Renaissance, New York, 1907, p. 285. J.A. Crowe and G.B. Cavalcaselle, A History of Painting in North Italy: Venice, Padua, Vicenza, Verona, Ferrara, Milan, Friuli, Brescia, from the fourteenth to the sixteenth century, ed. T. Borenius, London, 1912, III, pp. 285-286. G. Nicodemi, Girolamo Romanino, Brescia, 1925, pp. 144, 234. (Possibly) P. Guerrini, 'La Galleria d'arte del patrizio bresciano Paolo Brognoli. Note e catalogo,' in Commentari dell'Ateneo di scienze, lettere e arti in Brescia per anno 1927, Brescia, 1928, p.243. A. Venturi, 'Romanino da Brescia' in Storia dell'arte italiana: La pittura del cinquecento, IX, part 3, Milan, 1928, pp. 839, 841, 856. W. Suida in U. Thieme and F. Becker, eds., Allgemeines Lexikon der bildenden Künstler von der Antike bis zur Gegenwart, XXVIII, Leipzig, 1934, p. 550. M.L. Ferrari, Il Romanino, Milan, Bramante, 1961, no. 75. F. Heinemann, Giovanni Bellini e i Belliniani, Venice, 1962, p. 46. R. Bossaglia, 'La pittura bresciana del Cinquecento: i maggiori e i loro scolari,' in Storia di Brescia, II, Brescia, 1963, p. 1057. F. Kossoff, 'A New Book on Romanino' in The Burlington Magazine, CV, no. 719, February 1963, p. 74. C. Boselli, 'La Mostra del Romanino' in Arte Veneta, XIX, 1965, p. 208. F. Kossoff, 'Romanino in Brescia' in The Burlington Magazine, CVII, no. 751, October 1965, p. 518. B. Berenson, Italian Pictures of the Renaissance: a list of the principal artists and their works with an index of places: Central Italian and North Italian schools, London, 1968, p. 368. J. Shearman, The early Italian pictures in the collection of Her Majesty the Queen, Cambridge, 1983, p. 216. J. Anderson, ed., 'The Travel Diaries of Otto Mündler, 1855-1858' in The Volume of the Walpole Society, LI, 1985, p. 174. A. Ballarin, La Cappella del Sacramento nella chiesa di San Giovanni Evangelista a Brescia, Padua, Accademia Latavina di Scienze, Lettere ed Arti, 22 June 1988; ed. in A. Ballarin, La Salomè del Romanino e altri studi sulla pittura bresciana del Cinquecento [preprint of the texts deposited in the Biblioteca del Dipartimento di Storia delle Arti Visive e della Musica, Università di Padova], Cittadella, (PD), p. 166. A. Nova in F. Zeri, Pinacoteca di Brera: Scuola veneta, Milan, 1990, p. 398. Le Siècle de Titien: l'âge d'or de la peinture à Venise, exhibition catalogue, Paris, 1993, p. 397, under no. 71. A. Nova, Girolamo Romanino, Turin, 1994, no. 88. Acquisizioni e Donazioni: Arte dal Medioeva al Novecento 1996-1998, Rome, 1999, p. 64. L. Marshall, 'Luxury and pathos in Girolamo Romanino's Christ Carrying the Cross' in The Italians in Australia: Studies in Renaissance and Baroque Art, ed. D. R. Marshall, Florence, 2004, pp. 131-144, cover. E. Langmuir, 'Girolamo Romanino, Trento,' The Burlington Magazine, Vol. CXLVIII, no. 1244, November, 2006, p. 793. L. Arrigoni and V. Maderna, eds., Pinacoteca di Brera: dipinti, Milan, 2010, p. 418. Brescia, Esposizione della pittura bresciana, 1878, no. 33. Brescia, Duomo Vecchio, Mostra di Girolamo Romanino, May-Sept 1965, no. 51. London, Royal Academy of Arts, The Genius of Venice: 1500-1600, 1983-1984, no 83. Cremona, Santa Maria della Pietà, Vecchio Ospedale, and Museo Civico, I campi e la cultura artistica cremonese del Cinquecento, 27 April-31 July 1985, no. I.8.I. Canberra, National Gallery of Australia and Melbourne, Melbourne Museum, Titian to Tiepolo: Three Centuries of Italian Art, 28 March-16 June 2002 and 7 July-5 October 2002, no. 25. Cremona, Museo civico 'Ala Ponzone' di Cremona and New York, Metropolitan Museum of Art, Painters of Reality: The Legacy of Leonardo and Caravaggio in Lombardy, 14 February-2 May 2004 and 27 May-15 August 2004, no. 42, (entry by A. Bayer). Trento, Castello del Buonconsiglio, 29 July-29 October, 2006, Romanino: un pittore in rivolta nel Rinascimento italiano, no. 36. Tallahassee, The Mary Brogan Museum of Art and Science, Baroque Painting in Lombardy from the Pinacoteca di Brera, 18 March-20 July 2011, no. 1. Christ Carrying the Cross is a masterpiece of Girolamo Romanino's fully mature style and among the most potent and moving depictions of the theme in sixteenth-century Italian art. A leading painter of the north Italian school, Girolamo di Romano, who during his lifetime came to be called Romanino, was born between 1484 and 1487 in Brescia, then under Venetian rule. Active as a painter of frescoes, altarpieces, portraits and private devotional pictures, Romanino worked in numerous cities across northern Italy, including Padua, Cremona, Trento and Brescia, which remained his chief residence over the course of his career. Little is known about his early life or artistic training. Based on the evidence of his first documented works, scholars have assumed that--following a likely apprenticeship in his native Brescia--Romanino traveled to Venice, where he learned from Bellini and Giorgione, as well as from Dürer's great altarpiece, the Virgin of the Rose Garlands, then in the church of San Bartolomeo (1506; Prague, Národni Galerie). His artistic education also surely included a sojourn in Milan, where he would have seen the work of Bramante and Bramantino, and where he must have absorbed the Lombard interest in acutely observed naturalistic detail and the truthful transcription of quotidian reality. The influence of Lombard art, combined with that of Giorgione's and later Titian's cosmopolitan, High Renaissance style in Venice, would become fundamental to Romanino's mature style, not surprising given that Brescia is located approximately mid-way between Milan and Venice. Art north of the Alps, especially as mediated through expressively intense German and Netherlandish prints, would also become important to Romanino's pictorial language, though its influence would emerge and recede rapidly and often during the various phases of his career. The development of Romanino's style followed no clear or logically sequential path, but instead was characterized by sudden changes in manner and mood, often depending on the nature of the commission, but also surely a function of Romanino's protean and highly receptive artistic temperament. Over the course of his career, Romanino's work alternately showed a predominately Lombard, Venetian or northern European accent--or incorporated elements from all three artistic traditions--often, as the present picture demonstrates, to original and brilliant effect. The non-linear trajectory of Romanino's artistic development has given rise to considerable scholarly debate concerning the chronology of his oeuvre, for which there are few surviving documents. 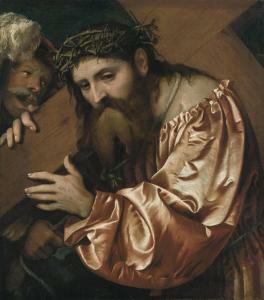 As with most of Romanino's easel paintings, no evidence exists concerning the commission or date of the Christ Carrying the Cross. Early scholars, such as Nicodemi (1925) and Venturi (1928), placed the picture around 1530 or slightly later, but Ballarin's proposal of a dating circa 1542-1543 (1988), although solely based on stylistic evidence, has been accepted by all subsequent scholars, including Alessandro Nova, the author of the definitive Romanino catalogue raisonné (1994). Christ Carrying the Cross is based on the dramatically charged episode from the Passion in which Jesus is forced to carry the cross on which he will be crucified from Pilate's palace in Jerusalem to Golgotha, as recounted in the Gospel of John 19:17-18: 'And he bearing his cross went forth into a place called the place of a skull, which is called in the Hebrew Golgotha: where they crucified him.' Romanino shows Christ half-length, dressed in a splendid copper-colored satin robe and wearing a crown of intricately twisted thorns. He is bowed under the weight of an enormous wooden cross, which he grasps with both hands while turning his head to the right, gazing out past the viewer as if deep in thought. Visible in the distance at lower left are barren hills silhouetted against a darkened sky, foreshadowing the Crucifixion. At upper left, the head of a brutish torturer emerges from the shadows, his mouth open and teeth bared as if taunting Christ as his clenched fist pulls on the knotted rope around the Savior's neck. The juxtaposition of the crude vehemence of the torturer's expression and the quiet restraint of Christ gives visual expression to the age-old struggle between good and evil, here also symbolized by the tormentor's placement on the left; that is, on the sinister side. Christ's robe seems to have slipped to expose his bare shoulder, alluding to the humiliation he will endure when he is stripped before being crucified, a poignant detail which heightens the pathos of the scene. The torturer's bushy moustache and red velvet beret with a full white plume, suggest those worn by the Landsknechte, German mercenary soldiers who sowed terror across north Italy in the sixteenth century, perhaps known to Romanino first-hand, but which he also would have seen in German prints by Daniel Hopfer and others, then widely disseminated (Bayer, 2004, p. 134). Notwithstanding the subject, the violence is subdued. The picture conveys a sense of peace, due not only to Christ's tranquil expression, but also to its balanced and harmonious design. The theme of Christ Carrying the Cross, in which the Savior is presented half-length and at close range against a dark background while tormented by his executioners, was enormously popular in north Italian painting in the first half of the sixteenth century. Initially appearing in the area of Milan in the 1480s, the subject was adopted by Leonardo and his followers in the 1490s, and was quickly taken up by Mantegna and his circle in Mantua as well. In Venice, iterations of the theme were produced by Bellini and his workshop, and it was famously treated by the young Titian soon after 1510 in his narratively expanded version in the Scuola San Rocco, Venice (D.A. Brown, et al. Bellini, Giorgione, Titian and the Renaissance of Venetian Painting, exhibition catalogue, Washington, D.C., 2006, p. 110). Lorenzo Lotto's Christ Carrying the Cross, painted in Venice in 1526 (Paris, Louvre; fig. 1), is also considered among the great interpretations of the theme prior to Romanino's. Such representations were intended to serve a devotional function, as a stimulus to prayer and pious contemplation. Most often relatively small in scale, they were typically commissioned by a private patron for display in a study, bedroom or small chapel in the home, as is likely to have been the case with the present picture. 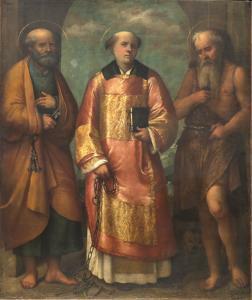 Their proliferation in sixteenth-century Italy partly reflects the influence of Thomas à Kempis's popular and widely read religious tract, The Imitation of Christ, in which the pious are exhorted to follow Christ's mandate to his disciples as recounted in Matthew 16:24: 'If any man will come after me, let him deny himself and take up his cross and follow me.' Kempis urged the faithful to 'Take up your cross, Follow Jesus. In that way, you will enter eternal life. Jesus opened the way for you by carrying his cross and dying on it. If you die with Jesus and share in his sufferings, you will live with him [and] share in his glory.' (Thomas à Kempis, Imitatio Christi, book 2, chapter 12; quoted Marshall, op. cit., p. 133). Romanino's Christ Carrying the Cross also enacts the directives contained in another popular devotional tract, the Meditations on the Life of Christ by the so-called Pseudo-Bonaventura, written around 1300, but frequently reprinted in Italy in the fifteenth century and later. In it, faithful souls were urged to identify and empathize with the sufferings of Christ by mentally rehearsing the events of his Passion, imagining themselves not as passive spectators, but as active participants in the drama 'as if it were happening before your own eyes.' The text accompanying an early sixteenth-century Lombard woodcut of this subject (fig. 2), from which Romanino's composition seems in part to derive, makes this explicit: 'O sinner, break the stone of your hard heart. See your loving Christ carry the heavy cross to Mount Calvary and suffer terrible death for the sake of sinners.' (trans. P. Humfrey, Lorenzo Lotto, New Haven & London, 1997, p. 98). The beholder's close emotional and psychological participation in the present scene is paramount. The landscape setting is minimally indicated, forcing the viewer to focus attention on the suffering Christ. Presented lifesize, and in a dramatic, close-up view, he seems a palpable and immediate physical presence, an impression emphasized by the sharp cropping of the figures and cross, implying that the scene exists in an extension of the worshipper's own space. The unidealized rendering of Christ's hands, with their somewhat gnarled, irregularly shaped fingers, emphasizes his humanity, contributing to the impression that he is tangible and vividly real. Although he does not meet the viewer's gaze directly, Christ turns in our direction, as if aware of something in the space just outside the picture. With his hair pulled back to expose his ear, itself gently illuminated and set conspicuously on the cross's central axis, Christ might have been thought by a pious sixteenth-century viewer to be listening to his prayers. Christ's voluminous satin sleeve, given prominence by its size and the complex pattern of folds which animate it, can also be understood in light of the picture's devotional function. Gradations of light and shadow describe the texture of the copper-colored satin with an astonishing effect of optical richness and immediacy. Enlivened by sparkling highlights, this passage of incandescent color reflects Romanino's fascination with luministic effects of the kind earlier achieved by his fellow Brescian, Girolamo Savoldo, in works such as St. Mary Magdalene at the Sepulchre (Los Angeles, J. Paul Getty Museum; 1530s), which shows the Magdalene enrobed in shimmering, mirror-like folds of sumptuous satin. While surely in part intended as a virtuosic demonstration of the artist's painterly skill, the sleeve's material richness and dazzling radiance must at the same time have been meant to evoke Christ's role as cosmic sovereign, and the splendor of his heavenly kingdom. This visually arresting passage also, as Louise Marshall has eloquently observed, 'draws the eye like a magnet [serving as] a summons to the beholder to reach forward and touch Christ's sleeve, so tantalizingly close and palpably tangible. In its curving swoop, the sleeve reaches out beyond the frame, beckoning us in and leading our eyes unerringly upward to rest on Christ's face'. (Marshall, op. cit., pp. 138-139). Romanino took up the theme and basic composition again in a tondo now in the Pinacoteca Tosio-Martinengo, Brescia (oil on canvas, 93 cm. diameter; inv. no. 83; ill. Nova, 1994, fig. 227). Dated by Nova to circa 1545-1546, it originally hung over the door to the chancery in the Ospedale Maggiore, Brescia, with another tondo of the Madonna and Child, today in the Ospedali Civili, Brescia. A small-scale copy of the present painting, formerly in the Sipriot collection, is in the deposits of the Brera Museum, Milan (oil on canvas, 37 x 30 cm. ; no. 5548). A Christ Carrying the Cross by Romanino was documented in the Brognoli collection in Brescia in 1820, but cannot be identified with certainty as the present picture. The first secure record of its whereabouts dates from 1853, when it was seen by Odorici in the distinguished collection of Cesare and Antonio Averoldi in Brescia. 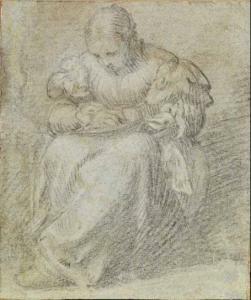 This points to the possibility that the picture may have originally been painted for a member of the Averoldi family, who in the sixteenth century were among the most prominent art patrons in the city, having commissioned works from Titian, Savoldo, Moretto da Brescia as well as from Romanino. By 1900, the picture had passed into the Crespi collection, Milan, following the 1914 sale of which it was acquired in Paris by Federico Gentili di Giuseppe. After his death in 1940, the picture was sold in a forced sale of his estate in Paris. By 1996, it had entered the Polli collection, Milan, from which it was acquired, in 1998, by the Pinacoteca di Brera, Milan. Restituted by order of the United States District Court, Northern District of Florida, on 6 February 2012, the picture was returned to the heirs of Federico Gentili di Giuseppe on 18 April 2012.